If you read the news frequently, or better yet, if you're a journalist and actually WRITE the news, you'd know just how depressing the state the world is in right now. There's not enough justice being carried out, too many privileged people misusing their power, the wrong type of values being instilled and just too much hostility in the world. It's not a lovely picture. So, do I've faith in humanity? I've been learning about the news industry for nearly three years now as part of my degree. To put it simply, a lot of times the news industry thrives on crappy, depressing news. 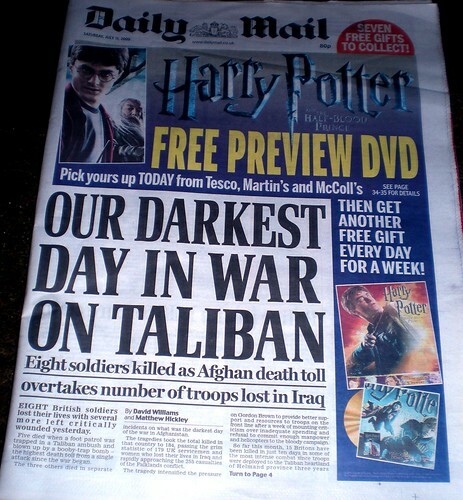 Murders, scandals and wars are every newspapers' dream. It keeps the papers loaded with stories that make readers rush to the nearest newspaper stand first thing in the morning. But just because that's all we hear and see in the news, doesn't mean it's representative of all that's happening in this world. Somewhere out there, and probably not far from where you are, there's good being done. If you actively LOOK for the worst in people, by all means you will find it. If you constantly look out for people's shortcomings, you WILL find it. But what kind of life is that?? If you go out of your way to actually believe rumours and put so much effort in digging the dirt on anyone, you probably need to look in the mirror and ask yourself what kind of person you're becoming. I choose to have a more positive outlook on the world because I think choosing to ignore the good that IS present in the world, is the real disservice to humanity. Not putting the effort to understand people that are different from you is just a case of being lazy. Ideally, as you grow older you should learn to think more critically and feel more obligated to fulfill your moral duties but this is not always the case. Apart from the past 3 years, I've been living in Malaysia my whole life. I'm proud to say that I've been brought up with very Malaysian/Islamic values and migrating overseas to pursue higher education has not affected the morals and values my parents have instilled in me. I find it rather upsetting when there's so much misunderstanding towards Islam especially since the 'Islam' that I see in the news is not one which I'm familiar with. Although not all is to blame on viewers/readers, it's worrying that people choose not to do a bit more research to find out the whole truth. There's more good people than there are bad people. The problem is it's the bad ones that are given the spotlight. And it's the bad ones that are so loud. So my advice to anyone is to be very critical of what you read online or in the newspapers. Getting a good level of education is superb but just a waste if at the end of the day you're so ignorant. And trust me, ignorance breeds a whole load of other problems. So yeah, that's partly why I choose to look on the bright side... I can go on and on.